What happened to Russia's agreement to eradicate Syria’s chemical weapons? WASHINGTON -- Long before last week’s deadly chemical attack in Syria, the U.S. and Russia brokered a deal -- in 2013 -- requiring Syria to destroy its chemical weapons stockpiles. Last year, the organization overseeing the elimination process declared the job complete. 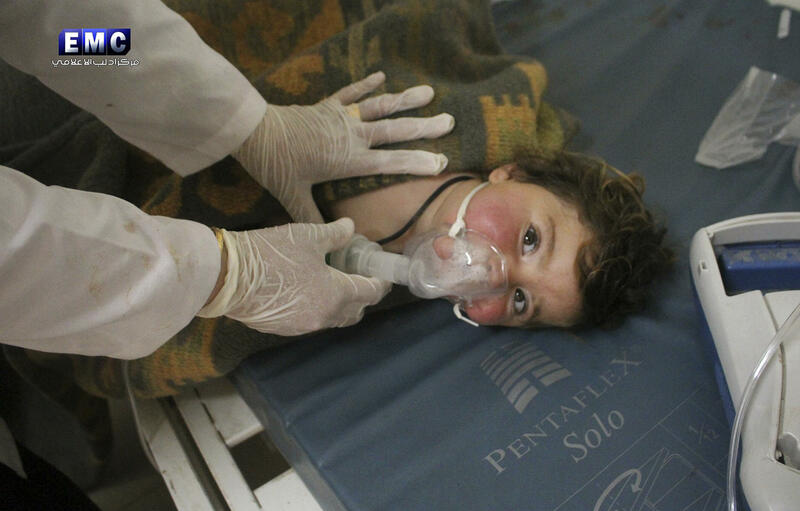 Then came last week’s apparent sarin gas attack that killed at least 72 Syrian adults and children -- an attack President Donald Trump blames on Syrian president Bashar al-Assad’s regime. And suddenly, those claims it seemed, had provided a false sense of security. “There are two possibilities,” Andy Weber, former Assistant Secretary of Defense for Nuclear, Chemical and Biological Defense Programs and a senior fellow at Harvard Kennedy School’s Belfer Center for Science and International Affairs, told CBS News. “One is that they held back a couple barrels of the sarin component, or -- and I don’t know which of these two possibilities is what happened -- but the second possibility is they had the people and the experts,” and developed small labs from there, he said. Reports of chemical attacks in Syria began around 2011, but a 2013 sarin gas attack that killed hundreds near Damascus triggered international outrage. The U.S., under then-President Obama, was on the verge of striking Syria in response -- similar to the strikes President Donald Trump carried out in the wake of the most recent attack -- but instead took a different course, agreeing to a Russian proposal to eliminate chemical weapons in Syria. The international community as a whole worked together on that deal, with the U.S. and particularly Russia -- which also happened to be Assad’s strongest ally -- in the lead. Without Moscow’s consistent pressure on Assad, the deal would never have happened, said Alexandra Bell, senior policy director at the Center for Arms Control and Nonproliferation who was a senior adviser within the State Department at at the time of the agreement. “Russia was integral in the implementation of the original deal,” Bell told CBS News. Syria identified and declared 1,300 tons of chemical weapons. Then, the Netherlands-based Organization for the Prohibition of Chemical Weapons (OPCW) and the U.N. oversaw the removal of those weapons, mostly sarin and mustard gas, placing tags and seals on them. Those chemicals were eventually loaded onto U.S. Naval ships, where a complex destruction process began. “That was 100 percent the key word,” Bell said. Weber said any remaining chemical weapons were sparse. Of course, Syria was responsible for identifying and declaring its stockpiles in the first place, although the U.S. and Russia -- especially Russia -- had a good idea where those stockpiles were, Bell said. U.S. officials always suspected there might be more. Mere months after the OPCW made that statement, reports began trickling out of Syria that the Assad regime was turning chlorine, which isn’t a banned substance, into chlorine barrel bombs, which are banned per the Chemical Weapons Convention. An August 2016 OPCW report was, perhaps, the most troubling. It concluded there was evidence that the Assad regime used chlorine barrel bombs in at least three instances. When those reports made their way to the U.N. and attempts were made to impose sanctions or some other punishment on the Assad regime, Russia -- and ostensibly China -- blocked any attempts, Bell said. The findings renewed previous concerns that the Assad regime still had access to other precursors, and fueled fears that the Assad regime had perhaps not declared all of its stockpiles in the first place. Chemical weapons are, after all, somewhat harder to detect and easier to hide than, say, nuclear weapons. “As the years went by, the U.S. always had concerns that there were undeclared stockpiles remaining and precursors,” Bell said. Precursor chemicals, which may be benign separately, can be combined within a binary weapon upon firing or in flight to release a lethal chemical agent, according to the Defense Department. The Obama administration made a “consistent push” in relevant international bodies to get to the bottom of Syria’s full inventory, but those attempts were largely futile, Bell said. Last week, of course, proved that Syria still has chemical weapons capability. The use of sarin was an “escalation” from the development of chlorine into weapons, Bell said. Despite the recent chemical attack, Weber disputed any claims that the 2013 agreement, and subsequent actions, were a failure. McCain: U.S. can address ISIS and Assad "at the same time"